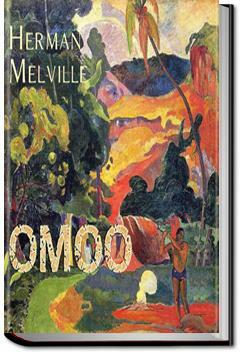 Omoo: A Narrative of Adventures in the South Seas is Herman Melville's sequel to Typee, and, as such, was also autobiographical. After leaving Nuku Hiva, the main character ships aboard a whaling vessel which makes its way to Tahiti, after which there is a mutiny and the majority of the crew are imprisoned on Tahiti. The book follows the actions of the narrator as he explores Tahiti and remarks on their customs and way of life. . . .are covered with dense groves; and the ungathered nuts which have fallen year after year, lie upon the ground in incredible quantities. Two or three men, provided with the necessary apparatus for trying out the oil, will, in the course of a week or two, obtain enough to load one of the large sea-canoes. Cocoa-nut oil is now manufactured in different parts of the South Seas, and forms no small part of the traffic carried on with trading vessels. A considerable quantity is annually exported from the Society Islands to Sydney. It is used in lamps and for machinery, being much cheaper than the sperm, and, for both purposes, better than the right-whale oil. They bottle it up in large bamboos, six or eight feet long; and these form part of the circulating medium of Tahiti. To return to the ship. The wind dying away, evening came on before we drew near the island. But we had it in view during the whole afternoon. "War being the greatest of evils, all its accessories necessarily partake of the same character." I read Omoo straight after Typee and was vastly disappointed. While the former novel has a great narrative which keeps the reader interested, I found this second book of Melville's to be quite boring. It reads more like a journal than a novel, if that makes sense. I read the edition (found in my wonderful public library, Harborfields, in Greenlawn, New York) published in 1968 by Northwestern University Press and the Newberry Library. It was edited by Harrison Hayford, Hershel Parker and G. Thomas Tanselle. The historical note was by Gordon Roper.